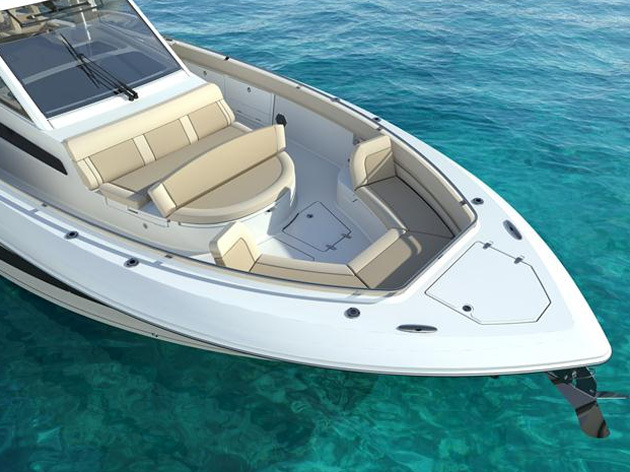 With the newest, biggest Boston Whaler center console yet, the 420 Outrage exits the world of boats and enters the world of yachts. When you walk into what I’ll loosely call the “center console” of the new Boston Whaler 420 Outrage, you’ll find a cabin worthy of a plush express cruiser. When you climb to the upper station, you’ll find a tower worthy of a serious sportfisher. And when you sit at the helm, you’ll find a dash worthy of, well, just about anything on the water short of a 100-footer. With the 420 Outrage, it seems that Boston Whaler has gone and built a yacht. The Boston Whaler 420 Outrage is the biggest Outrage ever. At the Fort Lauderdale boat show when I first gave the 420 a once-over, I had to question calling it a center console in the first place. The console itself is massive, so massive that calling the boat a walkaround wouldn’t be completely out of line. 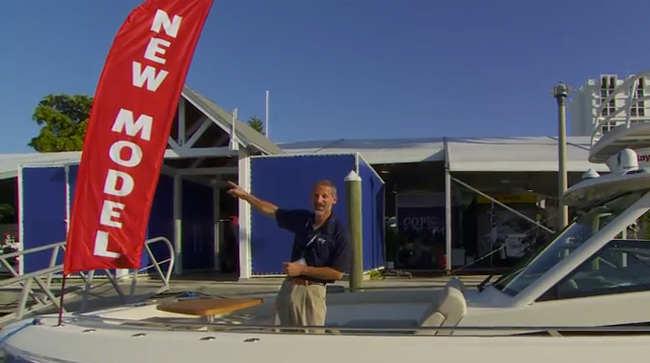 Nor would it be any more accurate; the boat offers CC-style 360-degree fishability, an open aft cockpit, and fishing space forward of the console. Though the raised forward console area serves as seating and/or a huge sunpad, many center consoles have followed this design trend and turned the forward cockpit into a mixed-use area. So even though it seems a stretch, tagging the 420 a center console is probably about as accurate as it gets with the current terminology. In fact, since Whaler has essentially expanded the center console concept to include a completely new type of boat, we need to expand our vernacular to match—henceforth I’m calling the 420 Outrage a CCY, or center console yacht. And just what lies inside that console? The cabin on this boat can only be described as shockingly large and plush. 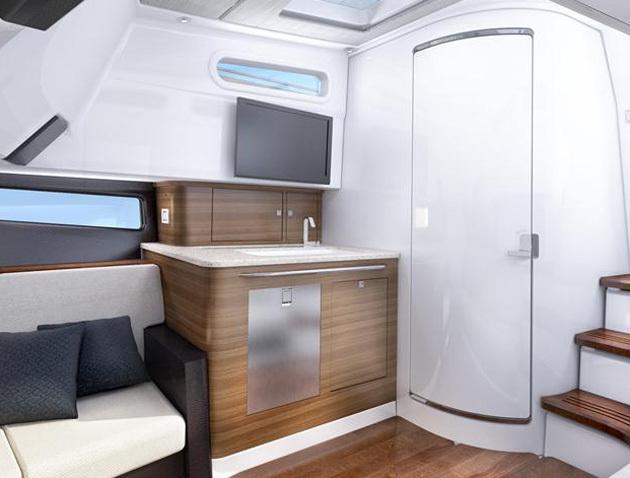 It has seven feet of headroom; a settee; a double berth that converts into a dinette; a galley with coffee maker, microwave oven, refrigerator/freezer, sink, and cabinetry with dedicated dish stowage; 16,000 BTU air conditioning; a 26” flat-screen HDTV; a hanging locker; an enclosed head with shower, a vanity with a pull-out countertop, a vacuum-flush commode and back-lighted mirror; and dedicated USB charging ports. It even has a central vacuum, for gosh sakes—and all of this stuff is standard equipment. Size matters when it comes to a center console cabin like the one found on the Whaler 420. Oh yes, and it also has racks for four rods, which would be my one knock on the cabin since four rodholders seem like an afterthought. Four rods won’t even begin to get you started on a boat like this, and as a die-hard angler, I’d happily sacrifice some of that voluminous interior to a rod locker. 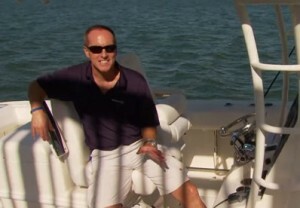 Then again, maybe the die-hard isn’t who will be buying this boat. Truth be told, a lot of fishing acreage is lost to the bow cockpit seating and the monstrous helm deck. That’s not to say there isn’t plentiful fishing space—there’s room for six or eight swinging rods, and trollers will be able to easily set out 10 or 12 lines from the aft cockpit—it’s just that much of the deck space is utilized for things other than wide-open fishing territory. 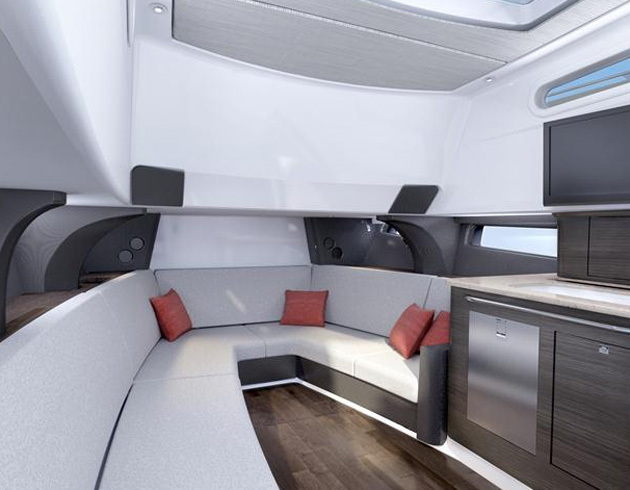 Sleeping accommodations, a galley, and an enclosed head are all inside this "console". One of the most valuable "other things," IMHO, is the expanded helm deck’s second-row seating. In virtually all modern center consoles, there’s only comfy forward-facing seating for three or four people. Sure, most boats have transom bench seats, too, but on anything but a flat-calm day they tend to be wet. In reality half the crew usually ends up standing and gripping the pipework, or you haul bean-bag chairs to make up for the helm seating deficit. On the 420 Outrage, there’s a convertible leaning post/bench seat just aft of the helm seating, so an entire crew of six can sit facing forward in a thoroughly protected and comfortable place. The helm itself gets high marks as well, with room for three honkin' big MFDs, electronic data displays, and yes, cupholders. The flip-down bolster seats with arm rests are also much appreciated. Kudos will continue when you move up to the seat-filled bow cockpit, not necessarily from an angler's perspective but certainly from a yachtie's. Thanks to the big sunpad and convertible back-rests on the bow lounge, four people can stretch all the way out. Sitting upright, there’s room for twice as many people to kick back and relax up here. 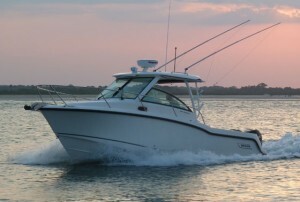 The emphasis in the bow cockpit of the Boston Whaler 420 Outrage is on seating and comfort, as opposed to fishing space. The upper station on this boat, on the other hand, is all about fishing. Thanks to the extra-large hard top there’s more room than expected, and instead of the minimal crow’s nest you often find on center console upper stations, there’s room for three people to sit in comfort. Room for improvement: the ladders built into the hard top supports are a bit awkward to use, since the top extends outboard beyond them. Pull your eyes away from that beautiful rack of horsepower for just a moment and direct your attention forward. Here’s something you fish-hunters are guaranteed to enjoy: the back of that aft row helm seating is one of the biggest rigging/tackle stations you’re ever going to find. It houses a monstrous lighted livewell with a viewing port, three tackle stowage drawers, a refrigerator/freezer, tool and leader holders, and a prep area with a cutting board and a freshwater sink. That sink even has both hot and cold fresh water—a smart move for those chilly fall runs to the canyons, and something you won’t see on many fishboats. And if angling plays second fiddle to yachting, the entire unit can be swapped out for a summer kitchen arrangement, which trades the livewell for additional stowage drawers and adds another refrigerator/freezer. Now look left, and take note of the triple rocket launchers stacked down the hard top support. Look right, and you’ll see three more. Glance up, and check out the five lining the back of the tower. Look back, to see five angled aft in the transom plus three more on either gunwale. Yeah, there are more rodholders in the bow gunwales, too. Let’s say you’ve utilized all these fishy features, plugged any one of the six fishboxes in the deck, found a quiet anchorage, and dropped the hook. There’s also an electric grill built into the back of the leaning post, so you can enjoy the freshest fish on planet Earth. 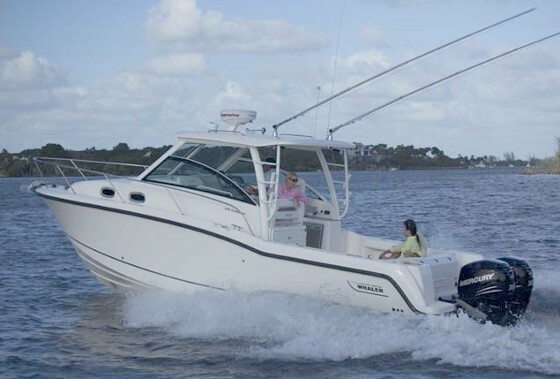 The Boston Whaler 420 Outrage is not—repeat NOT—like any center console you’ve seen before. Check one out for yourself, and you’ll understand why it deserves to be called a center console yacht; calling it a boat simply isn’t sufficient. 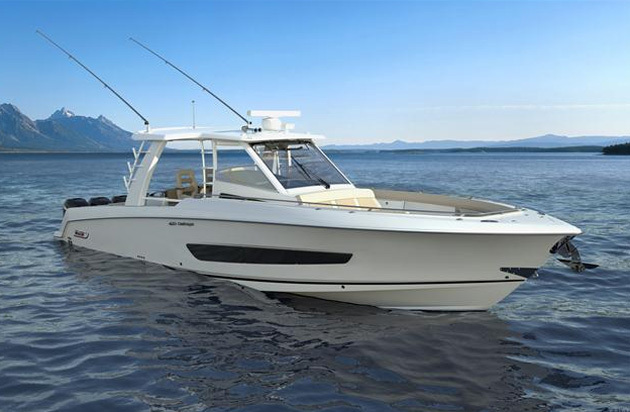 Other Choices: The new Everglades 435 is similarly sized and powered, but tilts more towards fishing and less towards yachting. 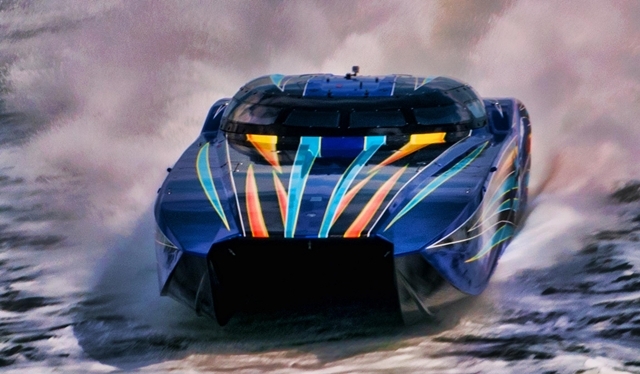 The Sea Vee 430 is another quad-engine rig that blends center console and cabin. 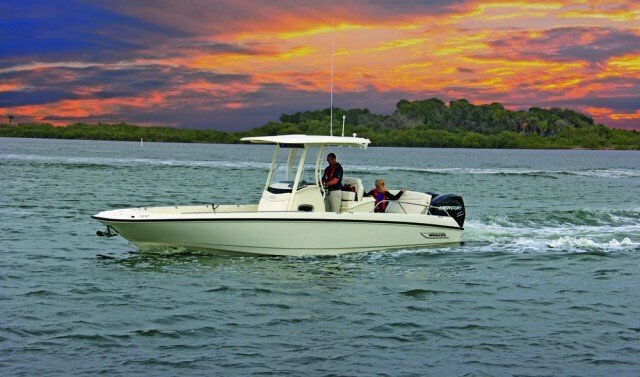 See Boston Whaler 420 Outrage listings. 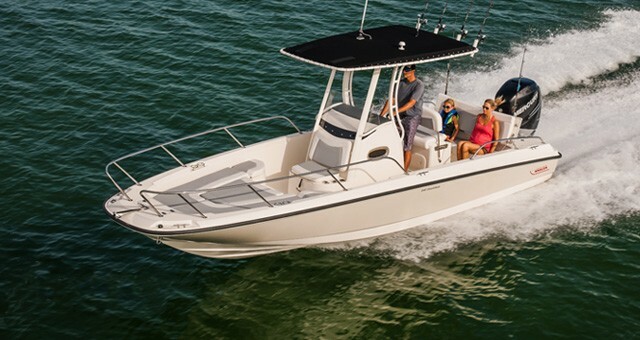 For more information, visit Boston Whaler.